The act of doing a LR is an act of sculpting the shape of available sources of knowledge–both as documents and concepts–trying to uncover the shape of the relationships through adding knots (nodes) and connections and removing that which is not useful, iteratively, as a structure emerges which is useful for both comprehension of what the student knows and how it all fits together, but all to show what is missing and what may be in conflict, as the student gets to grips with the concepts which encode the knowledge of their domain in text. This is why my PhD has come down to freeform manipulation of glossary terms (as created manually by the student, stored as wordpress blogs posts and continuing explicit relationships from the specific term’s perspective) in a non-linear graph space, where the terms can quickly move back into a regular word processing view. It is too much work conceptually and financially to work with both documents/citations as they are in Author and concepts as they are in WordPress in the Glossary. I have chosen to focus on concepts though, as that is what constitutes the shape of the knowledge space, with the citations remaining in a future implementation because they are important, they are what anchors the asserted concepts. I spent a considerable amount of time working on integrating the two but it is a mess at this stage. User can double click on desktop to create a new node. User types on the screen, like Scapple. User can hit enter and concept is shown in mid-grey, stored only in Author, not WordPress. Double click on it and Glossary dialog opens. 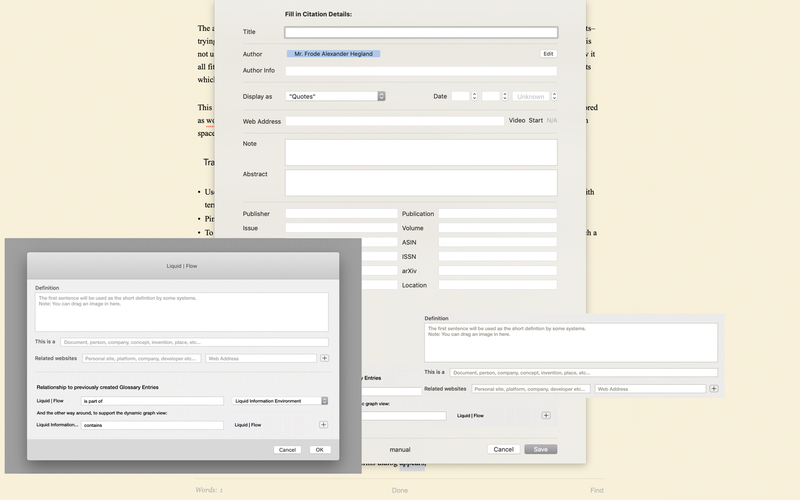 As per normal Author logic, user can edit in edit mode and read in read mode. In the future, citations should be in its own layer to support the assertions of the concepts and their relationships but not for the initial versions. I have not yet worked out how this can fit or how citations and concepts can link.